Senator Amy Klobuchar was one of hundreds of people who dropped by Stillwater Area High School this weekend for DaVinci Fest. 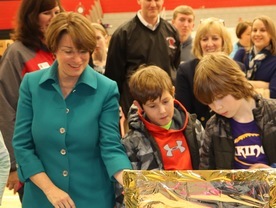 During her visit she toured the science fair and spoke with students about their projects. She also addressed a crowd to share a message about the importance of science and technology in education. See more photos on Facebook. What do you want for your kids? Help design strategic plan! Did You Know? It's estimated that in 2018 only 33 percent of jobs will require a four-year degree, while 57 percent will require some type of specialized training. Check out this video for even more staggering statistics about how the changing economy will impact our students' future. Your insights on this topic will help shape the future of our district. It's all part of our effort to develop a Portrait of a Graduate, which will serve as the foundation of our next strategic plan. Learn more. Is your teen just moody? Or is it something more? More and more students are dealing with stress and anxiety than ever before. Check out some tips from the Youth Service Bureau on how you can tell what's normal teen behavior and what might be signs of a more serious issue. Concerned about the mental health of kids in our community? So are we! Please join us on Tuesday, Jan. 16 from 6 to 7:30 pm at Oak Glen Golf Course in Stillwater for our next Community Conversation on mental health. We're coming together as a community to develop action plans to reduce mental health stigma and provide training, resources and support to our students and families facing mental health crisis. Learn more. Parents interested in sending their children to Stillwater Area Public School preschool are invited to attend an open house at one of our eight locations. Visit the classroom and meet our teachers to learn more about our program and register for the 2018-19 school year. Wednesday, January 10 from 5:30-6:30 p.m. The school board held its annual organizational meeting on Thursday night, which included the election of new officers for the year. Tom Lehmann was elected board chair and Jennier Pelletier was elected vice chair. Paula O'Loughlin will serve as clerk and Shelley Pearson as treasurer. The board also approved its 2018 meeting calendar.